To mark our silver anniversary, we considered having a fancy party with our friends in Japan and renewing our vows or doing something large and public. But then it dawned on us that we didn't do that for the marriage in the first place. Why should we do it now? It's really not our style at all. 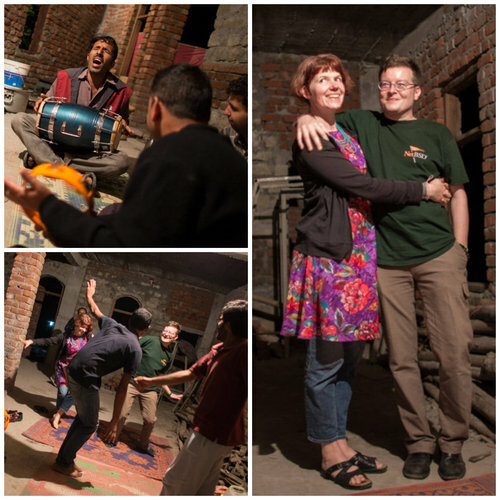 So we ran away to India and celebrated with an impromptu dance in the dirt-floored dining hall with the chef singing us an improvised song. Now that is our style. Memorable anniversary! We've reached this milestone through the usual trials and errors, ups and downs, storms and rainbows of any long relationship. We're still together, still friends, and planning to be together through the rest of the richer/poorer, sickness/health stuff we promised that Friday the 13th morning in front of Judge Longo. What I can't understand is how 25 years of marriage have elapsed, but I don't feel 25 years older. A mystery of the ages, for sure. Maybe I'll understand it by the time we reach our 50th in 2039.